FIFA’s disciplinary committee opened disciplinary proceedings against Swiss players Granit Xhaka and Xherdan Shaqiri for politically charged goal celebrations during their 2-1 World Cup win over Serbia in Kaliningrad. Xhaka and Shaqiri celebrated their goals by making a nationalist symbol of their ethnic Albanian heritage. Both of their families come from Kosovo, the former Serbian province that declared independence in 2008. Serbia doesn’t recognize Kosovo’s independence and relations between the two countries remain tense. The Polish Football Association was fined 10,000 Swiss francs ($10,100) and given a warning by FIFA’s disciplinary committee for a banner that the governing body deemed political and offensive. The banner was displayed during Senegal’s 2-1 win over Poland on Tuesday in Moscow. The committee also opened disciplinary proceedings against the federations of Argentina and Croatia for crowd disturbances during Croatia’s 3-0 win Thursday at Nizhny Novgorod. Sweden’s coach isn’t happy with how the Germany bench reacted after Toni Kroos’ dagger deep in stoppage time gave the 10-man Germans a 2-1 win at the World Cup. Germany coach Joachim Loew said he didn’t see anything like that happen because he was too busy hugging his assistant coaches. A draw would have put Sweden alone in second place in the group that includes first-place Mexico and last-place South Korea. Now it’s tied with Germany and will likely need points against Mexico to advance. Toni Kroos has revived Germany’s World Cup hopes with a superb late strike in the fifth minute of stoppage time to seal a 2-1 win for the defending champions over Sweden. Vela missed the 2014 tournament in Brazil after a fallout with team officials that started when he wasn’t picked for the 2013 Confederations Cup. So the L.A. Galaxy player appreciates his inclusion this time around in Russia. Vela dedicated his goal against South Korea on Saturday to his maternal grandfather, who died last weekend at age 80. In Vela’s second World Cup, he converted a penalty in the 26th minute to open the scoring for Mexico in a 2-1 win. It was Vela’s 19th goal for Mexico, and his first since Oct. 10. Vela has now played in five World Cup matches, including three in 2010 in South Africa. Gomez had entered the match after halftime as Germany coach Joachim Loew tried to boost the team’s attack. Mesut Ozil has been dropped from Germany’s starting lineup at a major international championship for the first time in his senior career. Ozil started every game in the World Cup in 2010 and was one of the stars of Germany’s winning squad in Brazil four years ago. The 29-year-old playmaker was dropped for the crucial game against Sweden after Germany’s upset loss to Mexico in the opening game. The traditional Argentina tea `mate’ is rivalling good old English tea for popularity among England’s World Cup squad. Uruguay’s team reportedly requested permission from Russian authorities to bring 400 pounds (180 kilograms) of mate to the World Cup. Argentina backroom staffers have been spotted drinking from a cup of mate at the World Cup. It has taken hold among the English, too, and there’s now a popularity battle between mate and England’s finest brew. Germany faces Sweden in the group’s other game later Saturday in Sochi. Carlos Vela’s penalty kick put Mexico up in the first half. – Associated Press writer Derek Gatopoulos reported from Rostov-on-Don. England relied on Harry Kane’s stoppage time goal to beat Tunisia 2-1 in its opening game. With the score locked at 1-1 after Tunisia equalized from a penalty, Kane was twice wrestled to the ground but was not awarded a spot kick. Brazil says Douglas Costa and Danilo have been ruled out of the team’s decisive match against Serbia on Wednesday. Neither will travel with the rest of the squad for the match against Serbia in Moscow. They will remain at the team’s base in Sochi for treatment. Lasmar said Costa’s injury, sustained against Costa Rica, was a bit more serious, although he did not mention a timetable for his recovery. – AP Sports Writer Tales Azzoni reported from Sochi. The referee awarded the penalty after a sliding Jang Hyun-soo handled the ball while trying to stop a cross from Andres Guardado on the left side. Goalkeeper Jo Hyeon-woo stalled for time to freeze Vela but the forward coolly knocked it into the right side of the goal as the `keeper went left. Belgium had a two-goal lead within 16 minutes after Hazard scored from the penalty spot and Lukaku angled a low, left-foot shot into the corner of Tunisia’s goal. The North Africans cut the lead through defender Dylan Bronn’s 18th minute header, but Belgium settled the game with goals either side of half time. Lukaku clipped a right-foot shot over advancing goalkeeper Farouk Ben Mustapha to match Cristiano Ronaldo on four goals as the tournament’s leading scorer. Tunisia captain Wahbi Khazri got his team’s second with almost the last kick. Amid Panama’s joy at playing at its first World Cup, the team also carries with it desperate pain and sorrow over the death of teammate Amilcar Henriquez. Gomez compared Henriquez’s story with that of Colombia defender Andres Escobar, who was shot to death days after his team was eliminated from the 1994 World Cup. Yet even after Japan’s surprise 2-1 victory over the Columbians, it is again the underdog as it prepares for a pivotal matchup with Senegal. That doesn’t mean Nishino is fearful of a team he says is physically superior. The teams have met three times in their history, all in friendlies, but haven’t played in 15 years. The plane, a twin-turboprop ATR-72 flown by the UTAir airline, landed safely, the agency said. Citing national aviation agency Rosaviatsiya, the report said the smoke came from overheated oil in one of the plane’s engines. Russia’s federal agency for air traffic said an engine burst into flames during landing on the Airbus airplane, but no emergency procedures were required. The aircraft landed with both of its engines working and the passengers disembarked normally, the agency’s statement said. Spain midfielder Jorge ”Koke” Resurreccion says he and his teammates are not being able to watch all matches in Russia because some are at the same time of the ”siesta,” the country’s traditional afternoon nap time. He told El Pais newspaper the early afternoon games are coinciding with the siesta and the ones after that are usually conflicting with the team’s practice sessions, so players can only watch the night matches during dinner time. Spain’s game against Morocco on Monday will be at night, as were its first two games in the group stage – a 3-3 draw against Portugal and a 1-0 win over Iran. Romelu Lukaku scored just before halftime to give Belgium a 3-1 lead over Tunisia and equal Cristiano Ronaldo’s tally of four goals so far at the World Cup. Lukaku also scored two goals in Belgium’s opening 3-0 win over Panama. Ronaldo has scored four goals in Portugal’s first two games. Belgium’s quick goal from the penalty spot against Tunisia ensured there were no 0-0 draws in the first 27 matches of a World Cup for the first time. There were no 0-0 draws in the 1954 tournament, which included 16 teams and a total of 26 games. Romelu Lukaku gave Belgium a 2-0 lead with a low shot in the 16th minute after a pass from Dries Mertens when Tunisia’s Ali Maaloul lost the ball on the halfway line. Hazard won the penalty when he was brought down by Tunisia’s Syam Ben Youssef on the edge of the area. It wouldn’t be the World Cup without some emotion from Brazil. 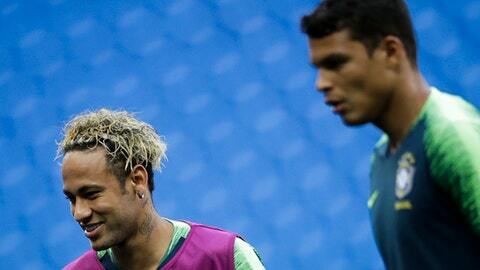 Thiago Silva is upset with his teammate Neymar for shouting at him during Friday’s tense 2-0 win over Costa Rica. Neymar scored Brazil’s second goal in the seventh minute of injury time, his first of the tournament and 56th overall for Brazil.